Secretary of Administration Justin Johnson, left, and Vermont State Employees Association executive director Steve Howard, right, at a meeting of the House Appropriations Committee Thursday. A months-long standoff between Gov. Peter Shumlin and the state employees union could be resolved with the involuntary elimination of fewer than 50 positions, a top administration official said Thursday. Even fewer employees would be laid off under the plan, Secretary of Administration Justin Johnson said, because some might be eligible to take newly created positions. 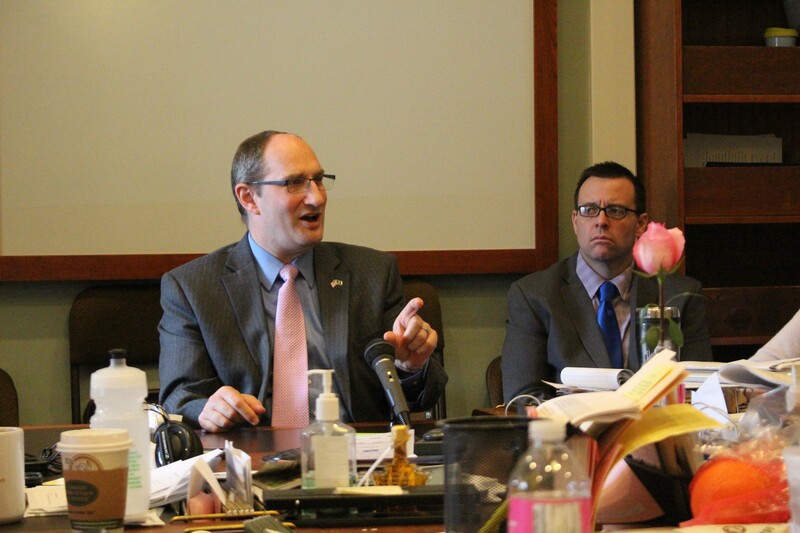 Johnson updated the House Appropriations Committee Thursday morning on the status of negotiations between the administration and the Vermont State Employees Association to achieve $10.8 million in labor savings requested by the governor in January. The administration expects to cut $2 million by reducing the number of temporary workers it hires and trimming pay increases to exempt employees and other managers. It hopes to save another $2.5 million by encouraging those already eligible to retire to do so later this year, as VTDigger's Elizabeth Hewitt first reported. That leaves $6.3 million to be found. Johnson told the committee he expects to eliminate 300 positions through retirements, vacancies and involuntary reductions-in-force. But, he said, "I think that the RIFs are gonna ultimately be a relatively small part of that." In an interview after the meeting, Johnson provided more detail: "I don't think it would be any higher than 50. It's likely somewhat less than that," he said. "It really ultimately just comes down in the end to how many folks, how many programs have to use RIFs as opposed to vacancies." Johnson added that if pending water-quality legislation creates 14 new positions, he would like to see them filled by those who lose their existing jobs. "One of the things we're looking at is whether it's possible for those people to not just leave state government, but to do different work," he said. "It's not about laying people off. It's about reducing the number of positions we fund." VSEA executive Steve Howard said Thursday that his union had suggested and fully supported the savings plans Johnson outlined. "We're gratified that the ideas our members have brought forward have been accepted by the administration, grateful for their cooperation, and we're glad that it's minimizing and potentially eliminating RIFs as a possibility," he said. "We will fight until every single job is protected." Disclosure: Paul Heintz's partner, Shayla Livingston, is a state employee and member of the VSEA's legislative committee.